It is our delight to welcome Lona Manning, author of A Contrary Wind, a variation on Mansfield Park. Lona’s extensive research on the French Revolution is for our benefit today. Did you ever read The Scarlet Pimpernel by Baroness Orczy? It’s a romantic and thrilling classic about the French Revolution. I’d like to share some of my research about the real lives of the refugees from that time. Leslie Howard as the Scarlet Pimpernel, in disguise as a tricoteuse, watching the victims being brought to the guillotine. 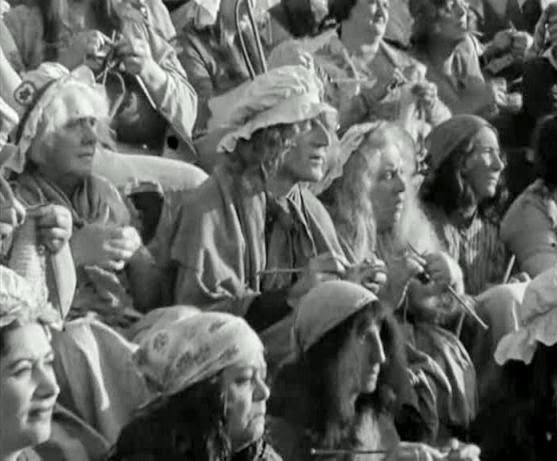 From the 1934 movie. Between 1789 and 1794, thousands of Frenchmen and women left their native country when their lives were threatened by the turmoil of the French Revolution. Many of these refugees, known as émigrés, fled to England. Of course, France had been England’s traditional enemy for hundreds of years, despite the growing commercial ties between them. At best, France and England could be described as frenemies. Some leading English intellectuals, notably the firebrand Thomas Paine, were enthusiastic about the French Revolution at the outset. Reform-minded Englishmen, well aware of the miserable condition of the French peasants, saw the French aristocracy as effeminate, decadent and the authors of their own destruction. But the tragic plight of the émigrés awakened much compassion from Englishmen and women from all walks of life. It has often been remarked that Jane Austen never wrote about dramatic political events such as the French Revolution or the Napoleonic Wars. However this does not mean she was untouched by them. There was an émigré in her own family – her cousin, Eliza Hancock De Feuillide. Eliza was not a Frenchwoman, although she had an exotic childhood in India. She married a member of the French aristocracy, who met his end on the guillotine when Austen was 18 years old. Eliza returned to England where she must have made quite an impression on the imaginative teenager. The sophisticated and flirtatious Eliza, who eventually married Jane’s brother Henry, is thought to be Austen’s inspiration for the calculating anti-heroines Lady Susan and Mary Crawford. Madame de Fouler’s husband was an aide to Napoleon. 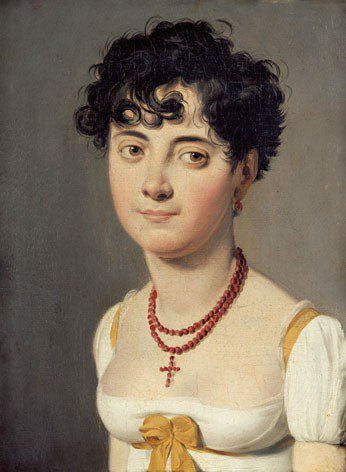 Women who had lost relatives during the Revolution sometimes wore red chokers or necklaces to symbolize the guillotine, and even cut their hair short, just as the victims’ hair had been cut before their executions. I liked this lady’s serene, candid expression so much that I chose it for the cover of my novel, A Contrary Wind, even though Fanny Price’s eyes are described as light blue and Madame de Fouler has brown eyes! England’s political class feared that the ideas of the French revolution would spread to England and cause a rebellion. This cartoon shows an uprising on St. James Street with the prime minister tied to a stake. The royal family also attempted to flee the revolution in 1791 but were captured near the border, at Varennes. Both Louis XVI and his wife Marie Antoinette were guillotined. Their son, the Dauphin, died in prison. Eliza had family in England to help her, but of course many émigrés were not so fortunate. Those who managed to escape persecution by crossing the English channel in whatever boats they could hire, often arrived with little more than the clothes on their backs, or at best, with a few jewels to sell. Fortunately, the English sprang into action to help the flood of refugees who washed up on their shores. John Wilmot, an English MP, raised public and private funds to support them. Dr. Charles Burney, father of the writer Fanny Burney, was instrumental in helping some of the most destitute widows and orphans. Not everyone reacted generously to the émigrés. Some Englishmen were vehemently anti-Catholic, seeing the influx of so many French Catholics — the natural allies of the Irish and Scots Catholics — as a political and religious threat. But in an act that was quite liberal-minded for the time, the University of Oxford printed 2,000 Catholic bibles for distribution to the émigré priests. As well, some English political leaders were concerned that the unchecked flood of refugees might include revolutionaries in disguise, infiltrating England with the purpose of fomenting rebellion among England’s working class. This fear provided a convenient excuse to repress home-grown English reform movements such as trade unions and pro-democracy societies, which were labelled seditious, that is, treasonous. However, the violence, anarchy and atheism of the radical Jacobins, a clique who seized power in France in 1793, turned public opinion in England against the Revolution. The enduring symbol of the French Revolution is the blade of the guillotine, dripping with blood, dispatching its blue-blooded victims to the shrill cries of the assembled mobs in a Paris square. Not all of the victims were titled members of the aristocracy. The increasingly bloodthirsty revolutionaries persecuted the nobility, but also priests, nuns, Jews, and eventually anyone suspected of harboring Royalist sympathies. The Terror spread throughout France; in the city of Nantes, hundreds of ordinary men, women, and children were packed aboard barges and drowned in the river Loire by the Jacobins, who were later overthrown and executed themselves. Many émigrés settled in London, which was already a multi-cultural metropolis, owing to England’s long history as a trading nation. As with expatriates everywhere, they tended to settle together, many finding lodgings and employment in the neighbourhoods of Marylebone and Soho. They learned that poverty was a great equalizer, doing away with the rigid class structure of their former lives. Former aristocrats, used to living in splendour, had to eke out a living as dancing instructors or French teachers or straw hatmakers. One of the characters in my Mansfield Park variation, A Contrary Wind, is a survivor of the Revolution who became a lady’s maid. Many great ladies turned to dressmaking and embroidery to keep body and soul together. The Duchesse de Gontaut painted miniatures, the Comtesse de Boisgelin gave music lessons, and the Duc d’Aiguillon copied sheet music for the opera house. Then there is the sad end of Joseph De Gripière de Moncroc, Marquis de Laval, who died penniless and alone in a shabby boarding house. He’d had a long and successful military career, and in fact had been present at Yorktown when Cornwallis surrendered to the American and French forces, when the British band famously played, “The World Turned Upside Down.” Subsequently the world turned upside down for de Laval, who lost everything, including his slave plantations in what is now Haiti, and he had only the charitable handouts from John Wilmot’s refugee aid committee to live upon. When examining his body, the coroner found a small wound on his neck but no other marks of violence. The evidence suggests to me that he nicked his jugular vein while standing over his washbasin and then, growing weak, lay down on his bed to die, but a boarding house servant named Mary Nott was convicted of murdering him and was hung at Newgate. The prosecutors offered no motive for why she would murder a penniless man. The Old Bailey trial transcript is available online. While acknowledging the generous reception they had been given in England, an overwhelming majority of the émigrés lived for the day when they might return home. When Napoleon rose to power, most of them went back to France in 1802, bringing to an end the romantic but tragic period of the émigré in England. Lona Manning loves reading, choral singing, gardening and travel. She has worked as an administrator for several charities, and is currently teaching English as a Second Language in China. She has written true crime articles for www.CrimeMagazine.com. “A Contrary Wind” is her first novel. Fanny Price, niece to Sir Thomas Bertram of Mansfield Park, is an intelligent but timid girl from a poor family, who is grateful for the advantages of education and breeding conferred upon her as result of growing up with her wealthier cousins. But the cruelty of her Aunt Norris, together with a broken heart, compel Fanny to run away from Mansfield Park and find employment as a governess. Far away from everything she ever knew and the one man she loves, will Fanny grow in fortitude and independence? Will a new suitor help her to forget? Or will a reckless decision threaten to destroy her own life and the lives of those she holds most dear? This variation of Jane Austen’s novel includes all the familiar characters from Mansfield Park, as well as some new acquaintances. Note to readers: There are some mature scenes and situations not suitable for all readers. This entry was posted in Austen Authors, book release, British history, Guest Post, Jane Austen, Living in the Regency, Living in the UK, political stance, Vagary and tagged A Contrary Wind, Baroness Orczy, French Revolution, Jane Austen, Lona Manning, Mansfield Park, The Scarlet Pimpernel. Bookmark the permalink. I made rather an extensive study of the French revolution (I even have a certification with distinction from the University of Melbourne in the matter). This is one of the little-known sides of the story that we miss out in our world history courses. There is so much of history that is not found in textbooks, Sharon. Although I felt myself relatively knowledgeable on this period, I learn something new quite regularly. Thanks for joining us today. Great post – coincidentally I’m writing some non-fiction right now about one of these revolutionary emigree families, who escaped to the UK, elevated their noble status along the way (as I suspect a lot did), and whose wayward son – a ‘rake’, in period terms – ended up in the South Pacific in the 1830s, where he had himself elected King of the Marquesas and tried to become Viceroy of New Zealand. None of this had any substance, of course, and later on he ended up as a piano teacher in Auckland. I would interested in reading your piece, Matthew. It is one heck of a tale. Dupetit-Thouras? George Pritchard? or someone else?